Tonya Vicknair has stepped down as Administrative Director of Boerne Soccer Club after creating and serving in that role since 2013. In her many years of dedicated service to the club, Tonya has helped to transform Boerne Soccer Club into the amazing organization that it is today and has been a steadfast team member providing guidance and support to the whole organization. 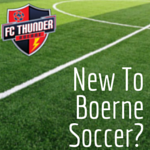 We want to express our gratitude and appreciation for the years and countless hours that Tonya has put in to help create an awesome soccer experience for so many players within all the programs offered by Boerne Soccer Club, FC Thunder. Thank you and we wish you all the best, Tonya! Jeff Ferguson will join the Boerne Soccer Club staff as the new Administrative Director. Please reach out to Jeff at admin@boernesoccer.org with any administrative questions.